A happy 195th birthday to Gustave Courbet, “one of the best, most audacious artists in his time, and a major player in the 19th century art revolution in France that moved the focus of art from institution to individual.” Reposting here, with thanks to Catherine Haley-Epstein for this great post. She notes: “Before Courbet, an artist was simply that – no fanfare, simply an artist/artisan. Remember it wasn’t until Impressionism that people started to marvel at the persona of the artists (i.e. Van Gogh, Cezanne, Gauguin)…. 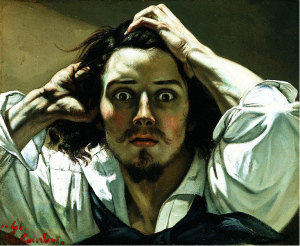 Courbet paved the way for new perceptions of art and artists given his [insistence] on mixing personal politics with painting.” Read on, and don’t miss the last image in the post….!! On this June day 195 years ago in France, Jean Désiré Gustave Courbet was born. Courbet was one of the best, most audacious artists in his time, and a major player in the 19th century art revolution in France that moved the focus of art from institution to individual. He can be described as the first artist rebel – before there was an Oscar Wilde, a David Bowie, a Rage Against the Machine there was Courbet.